Bringing to an end a multiyear investigation into Tim Eyman’s illegal campaign finance practices, Attorney General Bob Ferguson announced today that the State of Washington has filed a lawsuit in Thurston County Superior Court seeking $2.1 million in penalties against him, his associate William Agazarm of Citizen Solutions, and Citizen Solutions itself, as well as seeking an injunction barring Eyman from “managing, controlling, negotiating, or directing financial transactions of any kind for any political committee” in the future. “Taking kickbacks from contractors, using campaign funds for personal expenses, redirecting donations made for one initiative to a different initiative — it’s hard to imagine what more Mr. Eyman could have done to show his contempt for our campaign finance disclosure laws,” Ferguson said in a statement. Tim Eyman, as regular Cascadia Advocate readers know, is Washington’s most prolific sponsor of right wing ballot measures. He uses the Evergreen State’s initiative and referendum process to undermine representative democracy by forcing public votes on schemes purposely intended to wreck government. 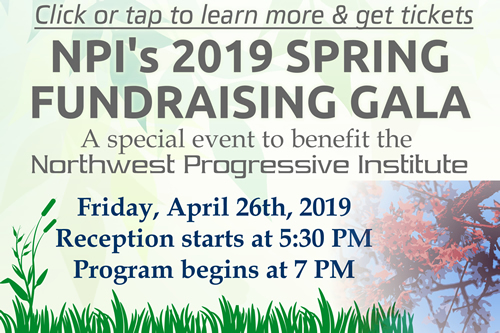 NPI has been organizing opposition to Eyman and his schemes for over fifteen years. Ferguson’s office was asked to investigate Eyman’s wrongdoing in September of 2015 by a unanimous Public Disclosure Commission, whose staff spent two and a half years investigating allegations that Eyman was illegally using money from one initiative (I-1185) to qualify another (I-517) while also failing to meet required reporting deadlines that are in place to permit the public to follow the money. PDC staff concluded Eyman broke the law and recommended that the case be given to Ferguson’s office, as the PDC cannot impose fines of more than ten thousand dollars. Ferguson’s investigation was delayed repeatedly by Eyman’s refusal to cooperate. State attorneys ultimately had to go to court last summer in an effort to get the state’s lawfully-issued subpoenas enforced. Judges in two different counties ordered Eyman and his associates to provide access to documents requested by the AG’s investigators, which they grudgingly agreed to do after Ferguson’s team asked that Eyman be held in contempt. The investigation resumed and was recently wrapped up after the state deposed Eyman. Now that charges have been filed in Thurston County Superior Court, Eyman and his attorney Mark Lamb will have twenty days to respond. 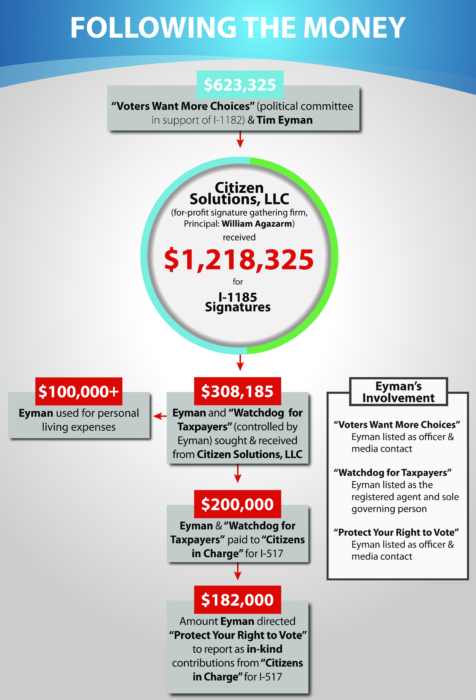 Eyman concealed the $308,185 payment from Citizen Solutions. If the judge finds this to be intentional, that penalty could total $924,555. Eyman concealed the true source of $182,000 in in-kind contributions to Protect Your Right to Vote on Initiatives [I-517 campaign committee]. If the judge finds this to be intentional, that penalty could total $546,000. Eyman spent campaign funds for personal use through at least five payments to Citizens in Charge, with a penalty up to $10,000 per payment. If the judge finds this to be intentional, that penalty could total $150,000. Eyman caused VWMC [Voters Want More Choices; what he calls his initiative factory] to file three inaccurate or misleading reports related to its payments to Citizen Solutions, with a penalty up to $10,000 per report. If the judge finds this to be intentional, that penalty could total $90,000. Eyman caused Protect Your Right to Vote on Initiatives to file five inaccurate and misleading reports related to contributions it attributed to Citizens in Charge, with a penalty up to $10,000 per report. If the judge finds this to be intentional, that penalty could total $150,000. Citizen Solutions and one of its principal, William Agazarm, concealed the $308,185 payment to Eyman. If the judge finds this to be intentional, that penalty could total $924,555. Today’s lawsuit is in addition to three suits Ferguson filed last year against Eyman, which were prompted by citizen action notices filed by NPI partner Washingtonians For Ethical Government and Keep Washington Rolling. 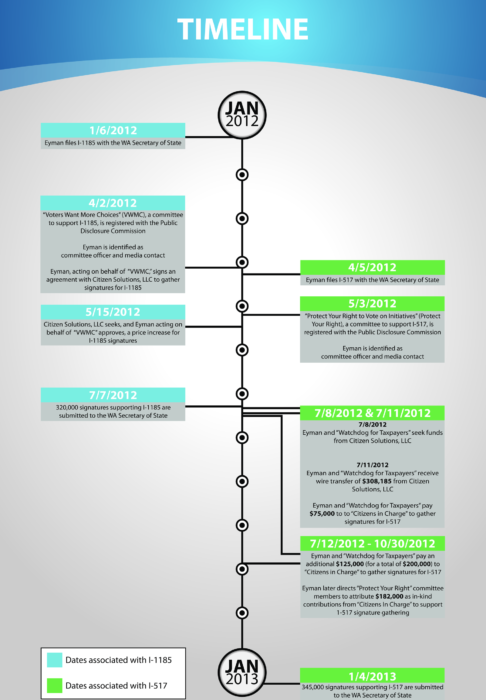 There are now four active lawsuits against Tim Eyman, his committees, and his associates by the State of Washington. We’ve published a statement thanking the Attorney General for taking this action over at Permanent Defense. It has been a long time coming. With the help of his lawyer Mark Lamb, Tim Eyman tried mightily to postpone this day of reckoning and buy himself more time to persuade his wealthy benefactors to turn the money spigot to his initiative factory turned back on. But he could not forestall Ferguson’s team forever. Now he has a fourth lawsuit to defend himself against. Meanwhile, he has failed to get the benefactors to open their checkbooks. He failed to make the ballot at all last year, and it appears he’ll fail again to make the ballot this year, which would be unprecedented (Eyman has had something on the ballot at least every other year going back to 1999). We will be tracking this lawsuit and the three previously filed very closely, and will provide updates on any developments with each here on the Cascadia Advocate.